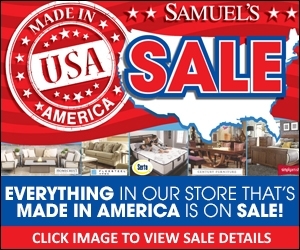 It's the All American Furniture Sale at Samuel's! If it is made in America, it is on Sale! Plus, we'll pay the sales tax on all American Made products during this special event! Top quality brands! ...including Flexsteel, La-Z-Boy, Simply Amish, England, Century, Serta, Aireloom and many more! Ask your Samuel's associate for complete details! To view our current ad simply click LEARN MORE link.